Bugaboo Runner a new innovation coming to its portfolio of best-in-class strollers and accessories in Spring 2015. Unveiled during last week’s ABC Kids Expo in Las Vegasand Kind + Jugend in Cologne, the Bugaboo Runner is a separate chassis designed purely for running that works with every current Bugaboo stroller model. Simply click any Bugaboo stroller seat onto the chassis with a set of adapters for a high-performance jogging option for parents designed to allow children to enjoy the comfort of the Bugaboo stroller seat they already love. Recognizing the unique needs of active parents, the Bugaboo Runner provides the option for parents to jog with their child (9 months and older) facing them or looking out at the world. Compatible with the Bugaboo Bee*/Bugaboo Bee3, Bugaboo Cameleon3, Bugaboo Buffalo and Bugaboo Donkey, the Bugaboo Runner can also be purchased as a complete jogging stroller with a dedicated Bugaboo Runner seat. The Bugaboo Runner quickly unfolds and collapses to its compact form, making it perfect for storing at home or taking along in the car. Parents can enjoy the freedom to move faster, whether they are out for a casual jog, training for a race or just want to enjoy a better running experience with their child. The Bugaboo Runner features large wheels with air-filled tires and a unique suspension system built into the chassis that absorbs any bumps along the way. The Bugaboo Runner’s three-wheel base provides a stable ride and its front wheel is fixed for utmost performance, delivering the smoothest, straightest run possible. Its adjustable handlebar ensures a comfortable, ergonomic running position. With just a squeeze of either hand anywhere on the handlebar, the brakes can be engaged to control speed, allowing a slow down or stop with minimal effort. 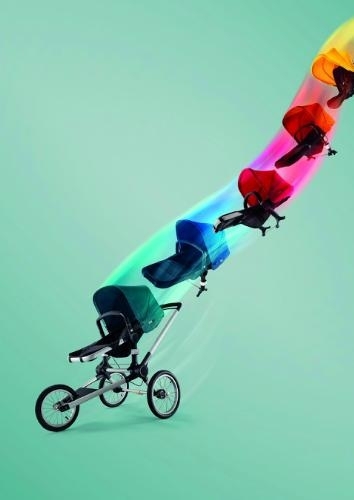 The IT stroller, Bugaboo Runner will be available in the United States, Canada, Australia and New Zealand starting in Spring 2015 and in Europefrom Fall 2015. The Bugaboo Runner jogging extension (chassis and seat adapters) will retail for $425 USD/CAD. As a complete jogger, the Bugaboo Runner will retail for $755 USD/CAD (chassis, seat and seat adapters).